Transparency Market Research has published a new report titled, “Automotive 48 Volt Battery System Market (Electric Vehicle Type, Vehicle, Components, and Region) - Global Industry Analysis, Size, Share, Growth, Trends, and Forecast, 2018 – 2026”. According to the report, the global automotive 48 volt battery system market is anticipated to surpass US$ 1.7 Bn by 2026, expanding at a CAGR of more than 65% during the forecast period. The market for hybrid and electric vehicles is anticipated to expand at a significant growth rate during the forecast period owing to rising stringency of emission norms and increasing pollution levels in the environment. Air pollution harms human health, particularly of those already vulnerable owing to their age or existing health problems. Consequently, responsible authorities are taking several steps to minimize pollution levels across the globe. Furthermore, integration of the 48 volt battery system in hybrid vehicles reduces emission. Rising demand for environment-friendly vehicles is likely to boost the market for automotive 48 volt battery systems. Expanding market for fuel efficient vehicles and the low cost of hybrid vehicle are likely to boost the market for 48 volt battery system market. Most manufacturers are likely to adopt the 48 volt battery system in their mild hybrid vehicles in order to enhance performance and efficiency of their previous version of mild hybrid vehicles. The 48 volt battery system can operate the electric supercharger, safety modules, and other electric components installed in the vehicle without any disturbance and power lag, as it has higher capability of energy recuperation and storage. Furthermore, the 48 volt battery system is backed by a 12 volt battery that supports the system as a backup unit in critical situations. Penetration of automotive 48 volt battery systems in plug-in hybrid and battery electric vehicle markets is anticipated to rise during the forecast period. This, in turn, is likely to drive the automotive 48 volt battery system market during the forecast period. Furthermore, the 48 volt system in battery electric and plug-in hybrid vehicles is anticipated to reduce the load on the primary propulsion units. This, in turn is expected to enhance the driving range of the vehicles. Moreover, the 48 volt battery system in the mild hybrid car provides up to 70% benefits of an electric vehicle by investing around 30% additional cost in the vehicle. Thus, a major restraint to the penetration of the 48 volt battery system in electric vehicles is its high cost. This can be overcome by integrating the 48 volt battery system in internal combustion engine vehicles and hybrid vehicles. In terms of electric vehicle type, mild hybrid vehicle is a highly attractive segment, as the mild hybrid vehicles previously used 12 volt batteries, which could assist the vehicle only for starting and attaining an initial propulsion, while the 48 volt battery system would assist in propulsion as well as provide power to most electronic and auxiliary units. Furthermore, other electric vehicle segments already contain high capacity batteries that assist them in propulsion and other functions, and adding the 48 volt battery system would increase the cost of these vehicles. The other electric vehicle type segments is expected to hold a lower share of the market as compared to that held by the mild hybrid vehicle segment. 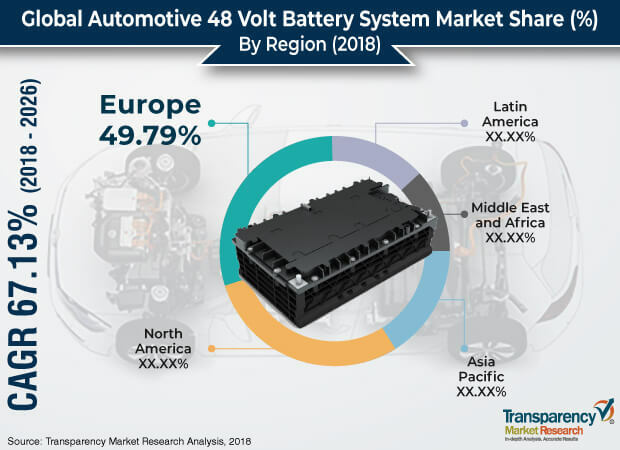 In terms of region, Europe is estimated to be a highly lucrative market for the 48 volt battery system, globally, followed by Asia Pacific owing to the presence of key manufacturers and technology providers in Europe. Furthermore, the technology is likely to get integrated mostly in luxury vehicles, which have a significant volume of production in Europe. Automotive manufacturers such as Volvo, Mercedes Benz, BMW, and Volkswagen are likely to adopt the technology at the earliest in order to enhance the performance and efficiency of their vehicles. Consequently, the market is expected to expand significantly in the region. Key manufacturers operating in the global automotive 48 volt battery system market are Robert Bosch GmbH, BorgWarner Inc. Delphi Technologies, A123 Systems LLC, East Penn Manufacturing Company, Enersys, Furukawa Electric Co. Ltd., Hitachi Ltd., Johnson Controls International PLC, Vicor Corporation, and ZF Friedrichshafen AG. Valeo SA and Delphi Technologies are at the forefront in the development of the 48 volt battery system technology and have already implemented it in several vehicles. Valeo SA has also showcased its all electric 48 volt battery system operated vehicle at the CES 2018.